As the world’s largest seller of Belstaff’s Pure Motorcycle Collection, we are huge fans of the classic British Motorcycle clothing brand. Not, of course, that Belstaff has always technically been a British brand. It was rescued from bankruptcy some 15 years ago by the Italian Melanoti family, which turned Belstaff into a highly regarded fashion brand. It then passed into German hands before returning, recently, to these shores as part of Jim Ratcliffe’s Ineos empire. The jacket that really re-established the brand’s credibility was a version of the Trialmaster that was worn by Ewan McGregor and his sidekick, Charley Borman, when they circumnavigated the globe, the long way round. Back in the day we sold a good quantity of that suit. At the time, it was a heck of a bit of kit, but of course the long, four-pocket, belted motorcycle jacket had been a motorcycle staple since the 1940s. In fact, it was Barbour who initially made the style popular. It was originally created for submariners in the war, and shortly the conflict came to an end it was introduced as a jacket for civilian use. 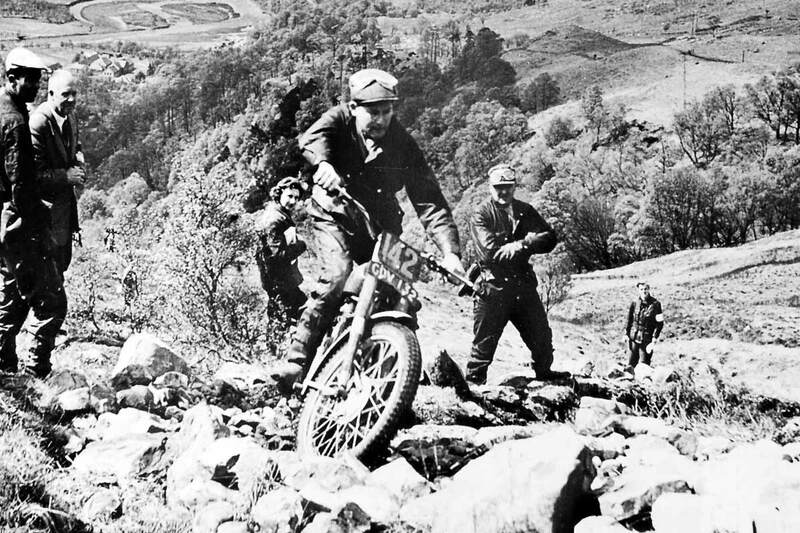 Trials riders around the world wore nothing else in the forties, fifties and sixties. Che Guevara wore one on his South American adventure. Steve McQueen raced in one, whilst Sammy Miller was rarely seen without his. The Ace Cafe boys always used them when it rained. But it was Belstaff who, in 2006, first put armour into a Trialmaster-style jacket. That jacket changed the way motorcyclists viewed wax cotton. Historically, a waxed cotton jacket had been little more than a waterproof outer. They were historically lightweight and foldable. They had no thermal lining, and the waterproofing came from a heavy coating wax. In terms of protection, they offered virtually nothing. The original 10 ounce Belstaff Trialmaster jacket. The new Trialmaster jacket from Belstaff, a was different. It was made from a heavy-duty, 10 ounce waxed cotton that was pretty abrasion resistant. It came with the best armour from D30 and a removeable thermal liner that meant you could wear it pretty much all year round. In the early days, the Trialmaster delivered its waterproofing, like the original, from a wax coating. 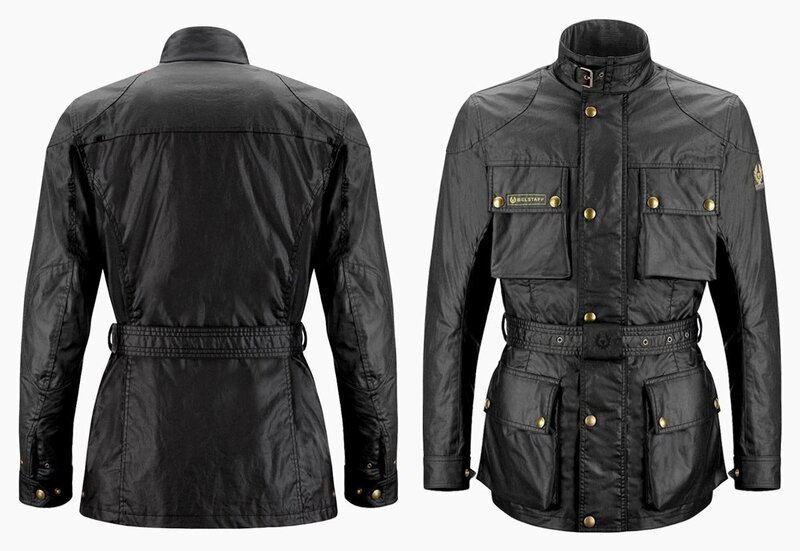 But within a couple of years, Belstaff fitted a high-quality, seam-sealed, Miporex waterproof and wind proof membrane. Overnight, this turned the Trialmaster into a serious piece of motorcycle wear. It still wasn’t a high-tech garment, but it was a very robust bit of kit that kept you warm and dry. You could even commute in it. 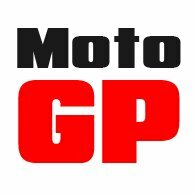 For many riders it became their only motorcycle jacket. No longer was it just a style statement. But, of course, even though the new Trialmaster was as much about function as it was about form, it was still the most stylish riding jacket the motorcycle world had ever seen. This was a jacket you could wear into any establishment. The concierge would even open the door for you. There was no chance that you'd be mistaken for a courier! 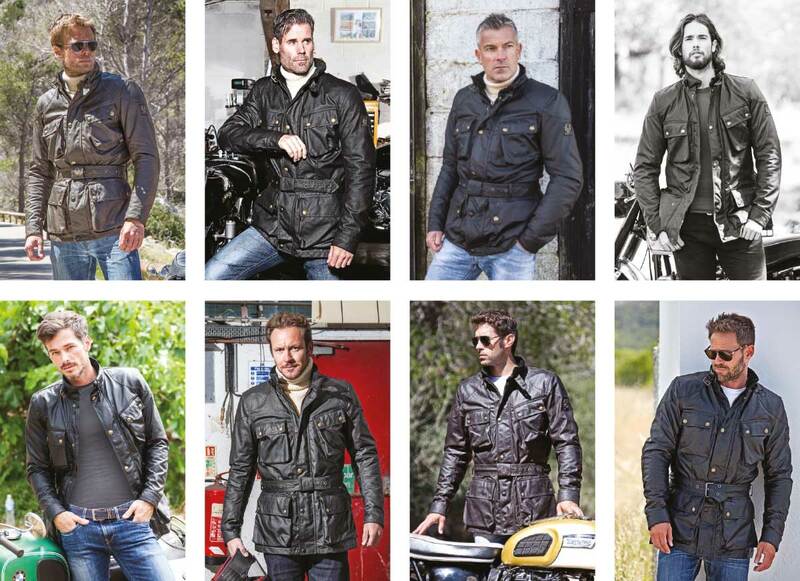 For nearly 10 years the Belstaff Trialmaster has ruled supreme. There have been many pretenders, but in terms of style, prestige, quality and reliability, no other retro jacket came close. But the Trialmaster was not for everybody. With its heavy, 10 ounce wax cotton, it was certainly a rugged bit of kit, but it was, and is, a heavy beast. For some people the 10 ounce Trialmaster is just too heavy and too cumbersome. We recognised this many years ago, and for the last four or five years we have been asking Belstaff to make a lighter version. Our entreaties were always ignored; or so it seemed. And then in 2017, Belstaff showed us this new six ounce version of the Trialmaster. It’s pretty much exactly what we had been asking for. The new-for-2018 six ounce Belstaff Trialmaster jacket. In essence, of course, it’s still the same jacket; pure Trialmaster from top to bottom. It’s still got a fully seam-sealed, Miporex waterproof membrane. And it still comes fitted with D3O armour in the elbows and shoulders. But this is a jacket that will be much nicer to wear in warmer conditions. It’s lighter obviously, and for mooching around in the new six ounce Trialmaster is going to be the one to have. If the 10 ounce Trialmaster is a suit of armour, the six ounce is a Savile Row suit. If you wanted to tour around Europe in the summer, you’d be happy to do it in the six ounce; you probably wouldn’t want to in the 10 ounce. Of course, there’s one thing the six ounce doesn’t have; and that’s a thermal liner, but for us this is never an issue. In fact, we often prefer a jacket without a liner as it gives the wearer the freedom to choose his preferred mid layer. In the case of the six ounce Trialmaster, that could be a submariner jumper, a merino wool top, a softshell or, for extreme cold, something like Warm and Safe’s brilliant, lightweight heated jacket. So, what’s our final verdict? Obviously, as we’ve been nagging Belstaff to make this jacket for so many years, we’re happy, and we like it. It’s not, in any way, a replacement for the original Trialmaster. The original is a do-anything, go-anywhere jacket which combines technical performance and practicality with style and functionality better than any jacket on the market. 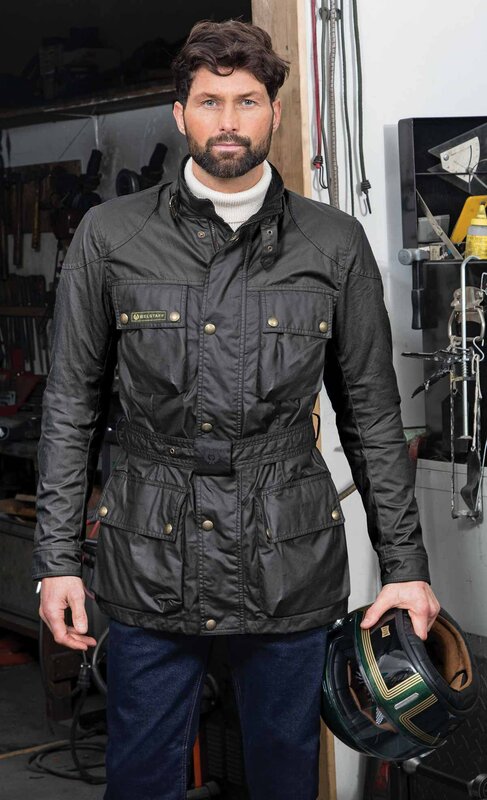 The new Belstaff Trialmaster six ounce jacket, which is sometimes known as the Belstaff Trialmaster Sheene jacket, is more casual and more summery. It’s lighter and easier to wear both on the bike and off. In hot weather it’s going to be so much nicer to wear than the 10 ounce. In the colder weather, you’ll need to layer up to stay warm. They are different jackets; the 10 ounce and the six ounce, and will serve different purposes. But both look the business. And both will work brilliantly. Just differently!